As we wrote here on EyeOnTampaBay recently, Go Hillsborough is dead, and it's time for Plan B. Now, Joe Henderson of the Tribune has finally caught up and now understands the implications of the Go Hillsborough debacle, has gotten on our wagon and is calling for Plan B. Unfortunately, his Plan B involves recruiting Jeff Vinik and "other business people" to get involved, and that's about it. Plan A is dead. Time for Plan B.
Vinik has made it clear he's not eager to take a position on the local political issues, other than we need solutions that improve mobility. Why doesn't Vinik get more involved in political issues that could help Tampa's most impoverished neighborhoods and workers with little income mobility? "Put yourself in my position," he said. In pursuing a project that could be worth $1 billion or more, "we think not only will it directly benefit downtown … we think this rising tide will lift all boats of this area." Assuming that, he said, "we need broad support in general to do this, and we need to listen and to talk to people. If you were me, would you come out strongly on political questions, voice strong opinions? … If we were to wade into this too deeply," it would "take the focus off what we're trying to do." And transportation is the ultimate local political issue. As far as the "other business people", be prepared for increased opportunities for graft, which is the problem we've run into Go Hillsborough with only $1.3 million. Just imagine a several billion dollar trough for "other business people" to gorge themselves on, and the questions that could be raised. What exactly, are these "other business people" expertise and qualifications in transportation? Could Vinik steer the Plan B to support his downtown vision of Vinikville? Would the Westshore Alliance and Downtown Partnership representatives force a rail project between downtown and the airport, which would offer no relief to daily commuters? Sounds vaguely like the Committee of 99. Yes, we've been talking about transportation issues around here since before 1999. And, listen carefully, make the opponents part of the process. At some point county officials will realize that people like Sharon Calvert of the tea party aren’t going to shut up, so have her suit up and get in the game. I don’t agree with many (most) of her positions and she can be, um, feisty. But she’s smart and she cares about the issue probably more than anyone you can think of. We actually agree with Joe on this. She can be quite feisty. And smart too! Not only that, she's already suited up and been in the game since 2010. If our "Very Smart Officials" had listened to Sharon a year ago, we would not be stuck in the jam with Go Hillsborough. Since Joe's brought the need for a Plan B up... actually, we've brought it up in numerous occasions in past few months in this blog. Sharon also brought up the need for a Plan B on September 25th on Florida This Week, where she was a panelist, along with Joe Henderson, to which Joe responded "we need a Plan B, C, D, E, and F". 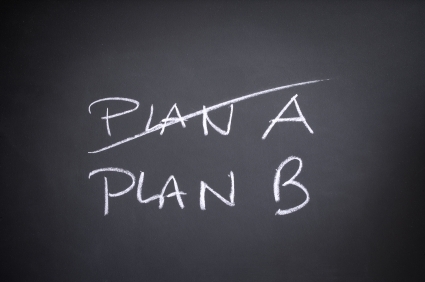 Regardless, we'll throw our hat in the ring for Plan B, adapted from our friend Ken Roberts. Pledge 50% of all new county revenues to the Transportation Trust Fund. This year the county found over a $100 million in new funds. much of this money comes from an improving real estate market and the attendant increases in home values. The BOCC must first perform their fiscal due diligence with our existing budget. They will have to make some decisions on millage rates, but what are we paying them for if they can't optimize the budget? Given the growth forecast for Hillsborough County, up to 600,000 new residents by 2040, enact an ordinance that establishes a mobility fee to mitigate the cost of development throughout the county as well as the cities. Downtown development and growth impacts the infrastructure as well, not just the suburbs where most of the growth will occur. A fair mobility fee would yield around $50 million per year. Raise the gas tax a nickel. That adds $25 million per year. A recent Go Hillsborough poll indicates strong support for this increase. The gas tax is essentially a user fee to pay for roads. Announce there will be no referendum for a sales tax increase. These actions would yield $125 million a year in today's economy. They require no consultants and can be accomplished with four votes at a county commissioner's meeting. This can be done right now. Remember, we need to do something now. At least one commissioner has stated publicly that $60 million of the $98.9 million could be re-appropriated to transportation. What to do with all that money? Lets start with some quick wins. Fix our roads first! The county has too long neglected our roads. The majority of the current road work in Hillsborough is funded through FDOT, even on some of the county roads. We have over 7000 lane miles of county roads, and hundreds of miles of F-rated roads in need or repaving, widening, and improved traffic flow. Don't delay any further. Fix our roads first! Invest in Automatic Traffic Management Systems (ATMS). While not a silver bullet, ATMS is cost effective, and can improve the flow traffic with more intelligent traffic signal optimization on many arterial roads. In parallel, explore analytics and big data solutions, such as smart phone apps that can help detect traffic and rough road conditions, which can be used to further dynamically reroute and optimize flow and fix roads quicker. In the 21st century, not every problem requires more infrastructure. Some issues can effectively and quickly improved with technology. Kill the Public Transportation Commission (PTC), or at least allow ride sharing such as Uber and Lyft to service Hillsborough without over regulating and impeding them. Support FDOT's TBX plans. It's not perfect, and FDOT will need to make improvements and listen to input from the community. But 600,000 new residents moving into the county won't "live, work and play" in the same neighborhood (there is much to offer everyone across Tampa Bay!). Adding capacity throughout the Tampa Bay Interstate system will be required to have any decent future for Tampa Bay. Support HART Transit Development Program (TDP), their 10 year plan for meeting transit needs across Hillsborough County. Consider expanding if ridership and fare recovery continues to improve relative to population growth. Ensure we are focused on improving mobility, and not trying to force a transportation solution into some economic development plan. Keep them separate. We can fund economic development for the economy's sake more effectively with a focus on that, and mobility focused on improving mobility where it is needed -- across the entire county -- not just around some job or economic hot spots. Sure, there are areas for some convergence we should plan and exploit, but that's the exception, not the rule. Focus on the busy times -- rush hour -- which means commuters. That's when everything is gummed up. Wasting time and money on the latest urban planning craze adds cost and delays for the vast majority of commuters and residents who will continue to enjoy living in the county. Limit the plans to 10 years. No one can effectively plan beyond 10 years. After that they are guessing. Review and refine the plans every two years based on successes, failures, revenue changes and new technologies. If the above actions were taken by our commissioners, we believe most people would stand up and cheer! If not, well, let us know how to make Plan B better.